Dry sandy or rocky forests and thickets with oak, pine (sometimes other conifers), aspen, birch, as in jack pine plains and old dunes; grassy clearings, sedge meadows, burned sites, shores. Some plants have roughish margins on the leaves, but not as rough (i.e., the projections not as long nor as dense) as in H. umbellatum; the line is hard to draw, and some authors combine the two. 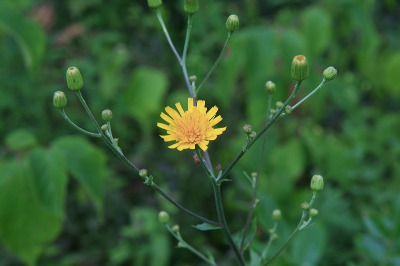 This is the species to which the name Hieracium canadense Michx. is applied in many works, but the name H. kalmii is earlier. Hybrids between this species and H. scabrum and H. umbellatum are known (and often suspected), and a specimen from Oakland Co. is a paratype of H. ×grohii Lepage (H. kalmii ×H. lachenalii). MICHIGAN FLORA ONLINE. A. A. Reznicek, E. G. Voss, & B. S. Walters. February 2011. University of Michigan. Web. 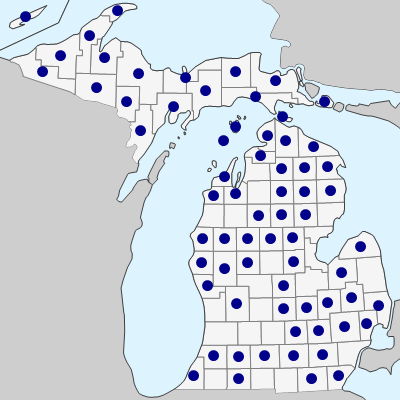 April 22, 2019. https://michiganflora.net/species.aspx?id=367.